Acoustic electric guitars are a great way to go. They give you the beautiful, rich tones of an acoustic guitar, and also allow you to showcase your art to a larger audience through an amplifier. Coffee shop to Concert, these big bodied instruments have you covered. So often, people skimp and get the bare minimum. Then they progress for awhile, only to be held back by their entry-level guitar. I’ve been there. I knew I was good enough to play. But I didn’t have an instrument that I could amp up to play for large audiences. So on that unexpected Sunday when they asked me to fill in for the regular guitarist, I could only shrug my shoulders. Now, you may not really plan on playing for an audience. However, there are other advantages to having a guitar with a pickup. With an amp output, you can also take advantage of the different guitar training software courses out there. Additionally, having a jack lets you play with looper effects and to mix and record your own music. Unless you plan on always playing your guitar in your bedroom with the door closed, it only makes sense to get one that can plug into an amp when you need. It helps to be a little bit savvy when guitar shopping. You see, these guitars are going to need to do two things well: acoustic AND amplified. Some guitars sound great when played acoustically, but only have the “bare minimum” pickups to pass as an “acoustic electric”. Others try to balance the two features. If you are mostly playing acoustically, there is probably little to worry about. So long as you purchase a quality brand name, the sound should be pretty much on par with all of the other at the same price point. But if you plan on doing a lot of amplified performing, it helps to pay attention to reviews and get one with a higher quality pickup that will deliver quality sound for any venue. 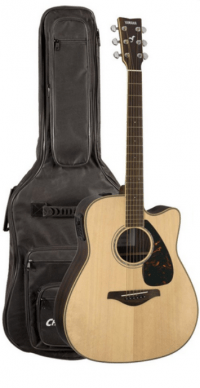 Below is a review of some of the best acoustic electric guitars around $500. I hope it makes your shopping process a lot easier. Update for February 2019: I just played a friend’s Seagull S6. I forgot how great these sound. Still my number 1 pick. 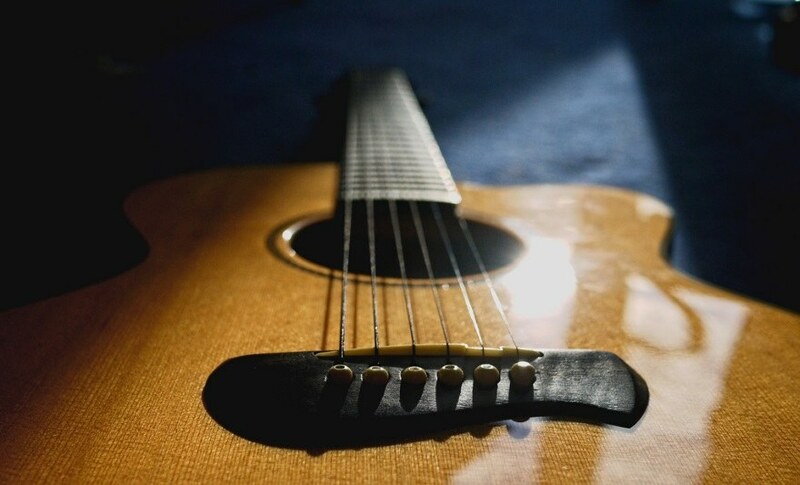 An easy pick for the best acoustic guitar is the Seagull S6. It’s a beautiful instrument that’s readily approachable, whether you are a complete beginner or have been playing for years. Wider set strings (reminiscent of the placement on classical guitars) and a body that falls on the smallish end of the spectrum make it a great value for younger players or new musicians who might be intimidated by the sheer size of some of the jumbo models out there on the market. There is no cutaway to speak of, so you’ll have to work a little harder to play higher than the 12th fret. For some, that may create an issue. The distinctive sound that comes from the S6 is born out of a solid cedar soundboard that crowns a body made of Canadian wild cherry wood. The result is a soft, perhaps even gentle sound that still projects clear and loud. The tonal quality is not so much muted as blurred a little bit around the edges, which gives it a soothing, woodsy, nonabrasive feel in a live setting. Unfortunately, the softness that gives cedar its cozy warmth is also what makes it vulnerable to dings and scratches. The satin finish on the guitar is quite beautiful and preserves miles of tonal integrity. However, it also wears fast and fails to do as much as a thicker poly lacquer would in the way of protecting the soundboard. You’ll have to determine whether sound or durability is your top priority (if it’s the latter, stay tuned for my number two pick). The Seagull S6 is an industry favorite and has a solid reputation among its peers for its versatility, broad appeal, and ability to age gracefully. There really is nothing out there that’s better for the price. I highly recommend it for any musician from beginner all the way to that awkward stage where you’re not sure if you count as “intermediate” or “advanced” (if you’ve been there, you know what I’m talking about). Even advanced players will find a lot of usability from this instrument, so I would also recommend this to the penny-pinching prodigy as well. While it is true that HPL does not have the same tonal composition as the real McCoy, it does offer several advantages. For starters, it is far, far more resilient than most woods on the market. It is less sensitive to the elements, staunchly standing up to drastic swings among climate changes such as heat, cold, humidity, and more. It is far more durable and will resist nicks and dings that even hardwoods would succumb to. The HPL, while lacking the complexity of tonewoods, does present a sonic characteristic of its own, contributing most notably to the bass end of the spectrum, with a spacious, deep quality without having an excessive thrum or any distracting “boom” to drag the remaining notes in your chords down. So, now that I have covered the economy of the material making up two-thirds of this fine instrument, I’d like to speak to the soundboard, which is made of solid Sitka spruce. This soundboard delivers a clear sweetness in the higher range and a mellow, easy tone with its middle range with sustain that goes and goes. The action this guitar has out of the box is deliciously smooth and needs little or no adjustment. Plug it in to hear your music really come to life. The amplified sound is full-bodied and rock steady. Despite its cost cutting molecular makeup, the Martin DX1AE manages to come through with a warmth that’s synonymous with high-end Martin guitars. Give it a shot and see if it doesn’t stand toe to toe with instruments that retail for triple its value. There’s a special place in my heart for Yamaha guitars. I received one last year as a gift for my collection and it has quickly become the favorite in my arsenal. The Yamaha FGX730SC has a lot of things going for it. The solid Sitka spruce top and Auditorium body shape create an environment ripe for a well-balanced blend of bright highs and cool lows. You’ll find the truest experience of these tones expressed in lush chords full of individually articulated notes. The spruce tends to miss the mark with the warmth of tone. A musician who’s “all about that bass” might feel like the lower range of this guitar lacks that boomy rumble that a different sound board could offer. Still, what this guitar lacks in warmth it makes up for with clear, almost sparkling sounds and truly wonderful fullness. The FGX is outfitted with a built-in chromatic tuner and the A.R.T. electronic pickup system (short for Acoustic Resonance Transducer). The latter is specially designed to minimize distortion and preserve the purest possible tone when playing through an amp. For those playing without any electronics, there is still plenty of projection to be found, as this guitar’s grand auditorium style body provides all the resonating, roomy sonic output that one expects from this versatile acoustic form. This guitar is exceptionally playable. The slick rosewood fret board and glossy neck make it easy for your hand to glide from low frets to high, while the well-placed cutaway makes those higher frets effortlessly accessible. The action is pretty much perfect right out of the case, as low as it can be without having to worry about buzzing. To cap everything off, it holds its tune for something close to forever. This is a perfect choice for an intermediate player looking for a guitar for home play or coffee house gigs. If you have the chance, I highly suggest you check one out. This Epiphone is making wakes with it’s solid wood top and flair for style. In a world of natural tones and muted colors, this Epiphone stands out like a piece of jewelry. The Hummingbird was made in the 1960s by Gibson and was popularized by artist such as Keith Richards and Sheryl Crow. https://www.pinterest.com/pin/312929874090469751/visual-search/?x=16&y=16&w=548&h=481 It’s striking, iconic beauty heralding a golden age of music. The Mahogany back and sides, combined with the large, squarish body, delivers incredible sound that accents the lower notes and makes this an extremely melodic guitar. The solid spruce top is designed to accent the high notes and balances out the Mahogany tones to keep the guitar sounding crisp and clear. While this guitar is well-made and delivers a beautiful sound, what lands it firmly on this list is the pickup system. So often, these companies will create a beautiful guitar and then insert a basic piezo or magnetic pickup that doesn’t truly capture the guitar’s beautiful tones. The shadow nano-flex undersaddle pickup is well above what most of of these guitars offer. It accurately captures the vibrations and delivers a tone that represents the sound quality of this guitar build. While this is one of the cheaper acoustic guitars on the list, it is an accurate recreation of the time-worn workhorse. For the singer-songwriter with an appreciation for history, the Epiphone Hummingbird is guaranteed to help them distinguish themselves as an artist. I find that Fender always creates some of the best guitars. While they are well-known for their electric guitars, their acoustic guitars are high-quality and deliver decades of playability. This one is available in the concert style or dreadnought body, and offers several different finishes to choose from. If you don’t mind the larger body size of the dreadnought, I prefer the tone and volume that the larger body provides. But the concert style sounds beautiful as well. The defining factor on this guitar is the Rosewood back and sides. Normally you see Mahogany in this price range, and the rosewood brings a new tone that offers more clarity on the high notes with clear ringing overtones and less of that mid-range muddiness that often haunts the Mahogany body guitars. This Fender uses x-bracing and a solid top (spruce), which enhances the brightness of the Rosewood. I feel like the Fenders tend to be a little brighter, anyhow, and this one brings the excellent clarity and brightness that you would expect out of the brand. This makes this guitar especially good for playing with other instruments, where it needs to be able to cut through the mix.. The fingerboard uses a specially-shaped “rolled” edge which makes this a good choice for folks with small hands or beginners. The Fishman Presys pickup and preamp is an excellent little unit with an easy-to-change battery and a built-in tuner. Overall, this is one of my favorite guitars. However, I will likely never own a Fender because I always choose the Mahogany bodies. But for the shopper who wants the best acoustic guitar for growing into, I think the Fender CD-140SCE is a hard one to beat. The Takamine GD93CE is my darkhorse in this lineup. This instrument is a relatively new face in the acoustic crowd, as the entire G Series was just debuted by Takamine in 2013. Though the GD93CE is still practically in its infancy, this guitar is already making an impression. The slim mahogany neck and 12-inch radius bound rosewood fretboard is a dream companion for any musician with hands on the small side. 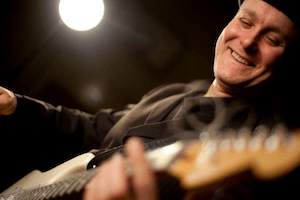 If you’re new to guitar or have trouble with chords, this is a great option to consider. The dreadnought cutaway body is a classic shape with great functionality, providing you with comfortable positioning and easy access to the higher frets. The preamp system is loaded with useful electronics, including an onboard tuner, 3 band equalizer and gain controls, EQ bypass, and more. 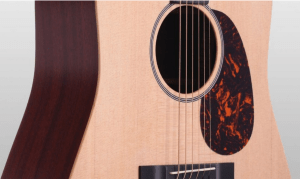 Unplugged, this guitar still offers a bright, articulated tone with an almost bell-like ring, thanks to the solid spruce soundboard and rosewood sides. The thing that makes this guitar distinctive is the exceptionally beautiful 3 piece back. A quilted maple centerpiece is flanked by two rich, warm rosewood pieces for a truly stunning contrast in color and wood grain. Trust me…you’ll have to see it to really appreciate it. You’ll be tempted to leave your guitar on its stand backward. Aptly named, the Exotica proudly is a 360-degree statement piece. From back to the sound board, it’s made from cocobolo, a beautiful, tropical hardwood from Central America and Mexico. Don’t be fooled by its distinctive, marbled striations: this exotic tonewood is more than just a pretty face. The tone coming from this instrument is clear, uncluttered, and responsive. Moderate note decay offers you the experience of a resonating, even syrupy sound without having to sacrifice distinct note articulation and individuation. This is especially true with notes on the lower end of the register, which is where cocobolo guitars really show their strength. Don’t be fooled by its distinctive, marbled striations: this exotic tonewood is more than just a pretty face. The tone coming from this instrument is clear, uncluttered, and responsive. Moderate note decay offers you the experience of a resonating, even syrupy sound without having to sacrifice distinct note articulation and individuation. This is especially true with notes on the lower end of the register, which is where cocobolo guitars really show their strength. This is especially true with notes on the lower end of the register, which is where cocobolo guitars really show their strength. The Exotica comes with a great set of onboard electronics, including a built-in chromatic tuner. The preamp system also includes the distinctive Aphex Exciter, which is basically an EQ that’s especially nice for acoustics. It enhances the harmonic quality of your sound and adds volume without adding the fuzzy, scratchy gain and interference that many of the conventional onboard EQs on the market tend to contribute. High gain is fine for metal, but it needs to stay far, far away from my acoustic sets, thank you very much. The onboard electronics here will help you maintain that simple, melodic, easy sound that made you reach for an acoustic in the first place. The black NuBone nut and saddle are sleek and pretty as well as functional, providing resonance that’s more comparable to their genuine bone counterparts than the plastic accessories you tend to find on guitars in this price range. The action on this instrument is great, even right out of the box. Some musicians may find it a little high for their liking, but that’s easily remedied. If you feel like the action could be lower, there are dozens of online tutorials for how to do this at home, but if you’re not the wildly adventurous, handy, do it yourself type (I’m not), any guitar tech or music shop should be able to make that adjustment for you. Overall, this is an amazingly beautiful and unusual guitar that will turn heads with both its outrageous looks and its rich, complex sound. It’s really quite a find.